West Bay marks the Western most boundary of Chesil Beach. It is a beautiful fishing village that is very popular with tourists in the summer. For some strange reason, West Bay seems to be the least popular of all the easily accessible marks on Chesil, and I can not think why. When ever I have fished, I have always had a reasonable catch at least. On a few occasions, I have had some very good sessions catching Bass, Plaice, a large Bull Huss and a Thornback Ray in one session. I have to admit I don’t fish West Bay that often, but then I do live on Portland and I would have to pass a lot of other good marks to get there. 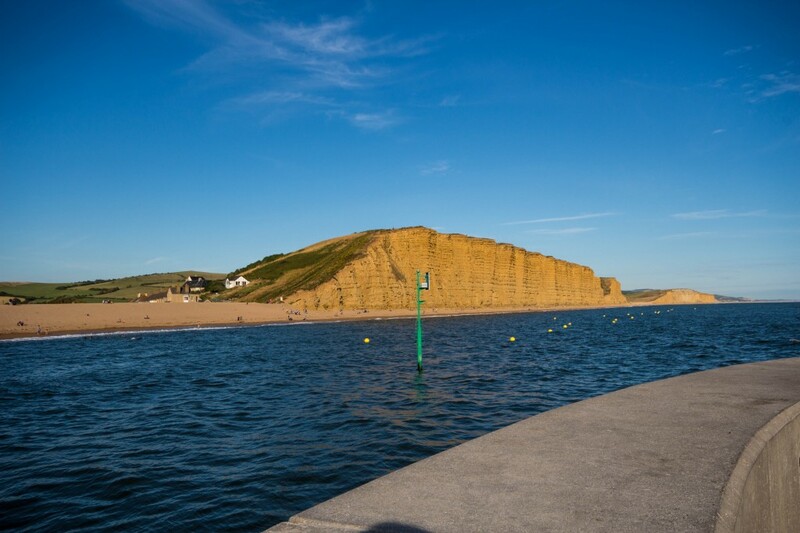 West Bay can be split into four sub marks: The inner harbour, The piers either side of the harbour entrance, and the two marks on each side of the piers. Inner Harbour: There are a lot of boats moored in the harbour, so you have to make sure your casting is accurate to avoid hitting any of them. This mark is more of a summer mark. 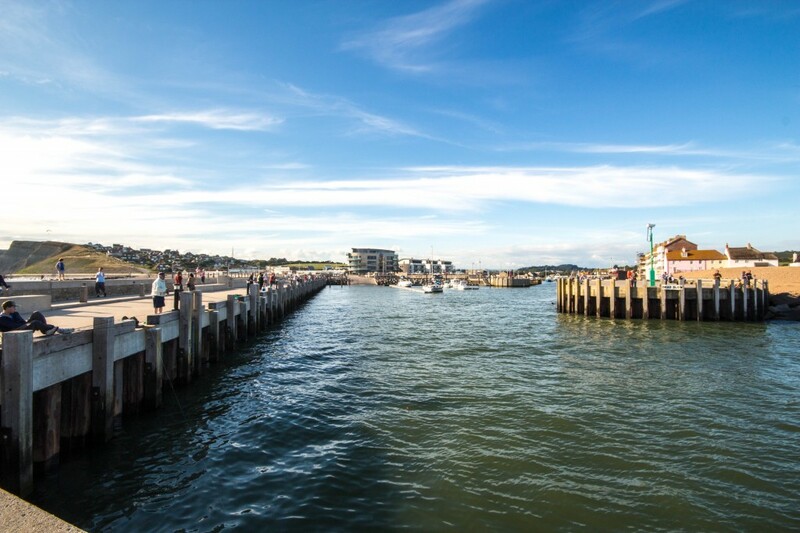 The main species that can be caught are Bass, Mullet, Flounder and in the spring and Summer it is possible to catch Salmon and Sea Trout from the sluice gates at the top of the harbour. Just remember that to fish for Salmon and Sea Trout, you will need an Environment Agency licence for migratory fish, even for fishing in the sea. Bass come into the harbour over high water and chase the bait fish into the corners. Lures work very well for the Bass, but I have found you need to use smaller lures for the best results. Surface lures are my preferred method, with Seaspin Pro-Q 90 or a Patchinko 100 being very good in marinas. Many of the Mullet are Thin Lipped, so they can also be caught on Mepps spinners, baited with a small piece of Ragworm. The Thick Lipped Mullet are best targeted with bread. Access to the inner harbour is good and is a short walk from the car park. It can get quite busy around the harbour with tourists. If you are looking for peace and tranquility, this is not the mark for you. Piers: Both piers are popular with novice and more experienced anglers. Access to them is very easy. The right hand breakwater and pier has been rebuilt and extended a few years ago. allowing easy wheelchair access for disabled anglers all the way to the end of the pier. One safety note I would make is although it is great for wheelchairs, there are no barriers or railings making it a little precarious for those with small children that like to run around. It is possible to fish both sides of both piers, but the outer part of the new pier is made up of large rocks and needs care and a fair amount of scrambling to get to. Amongst those rocks are lots of Wrasse, Pout, Pollock and if you are lucky, Bass. Float fishing or lure fishing is the best method to avoid tackle losses. Fishing on the inner harbour side of the pier, gives novices plenty of opportunity to practice basic tactics. Fish can be caught by simply dropping a line straight down the side, or using float fishing tactics. As a rule the fish tend to be smaller, but now and then a decent fish will show up. Numerous species live within the more sheltered waters of the inner piers. These include Small Bass, Black Bream, Flounder, Pout, Pollock, Garfish, Mackerel and Wrasse. During the winter small Whiting are caught in numbers. The pier ends are in fairly deep water, which allow anglers to target some of the species more associated with Chesil. In the Summer Smoothound and Rays can be caught from them, with Cod and decent sized Whiting in the winter. I have seen some decent sized Pollock caught on float fished Mackerel strip from the ends of the pier at dusk. The same float tactics are great for Mackerel and Garfish that are present most of the summer. The end of Chesil Beach: Looking out to see on the left hand side of the harbour is the end of Chesil Beach. The shingle is much finer here than anywhere else on the beach, it is more like a fine gravel. Between the harbour and the first set of cliffs to the east is a small beach. During the day in the summer it would be mad to try and fish it unless the conditions were rough and the weather poor. Holiday makers pack themselves onto the beach in their hundreds. Even so I have seen irresponsible anglers feather for Mackerel when it is packed. Some anglers head much further along and fish under the cliffs. It can be extremely dangerous to risk doing this. Only last year, just along the coast, a large section of these type of cliffs slid down and killed a woman on holiday. Once the sun goes down, the beach is ideal for targeting Rays and Plaice, Dogfish, Smoothound, Bass, Gurnard, Mackerel and Pout during the summer. In the winter it can produce lots of Whiting in the evenings. It can also produce the odd Cod into double figures. In the spring the plaice start to show from the end of March. Although these fish are quite thin after their winter spawning, they show up in numbers. In the Autumn the numbers are down, but the fish are much fatter and in prime condition. Dabs and Flounder can be caught all year round. The Plaice are normally at range, so use a single hook clipped down rig, baited with Ragworm and tipped with squid. Live Peeler Crab and mussels make great alternative baits, and often sort out the larger fish. When a SW storm hits the beach Bass and in the winter Cod can be caught in close. The best bait is to use a large squid or Mackerel bait on a pennel rig. West of the Harbour: I have no idea if the area looking out to sea on the right has a name, but I do know the ground here changes. It is a mixture of reefs, groynes and patches of sand and shingle. This attracts a different range of species. Undulate Rays and Bass hunt the mixed ground, that are home to Black Bream, Gurnard, Wrasse, Pollock and Conger. This is an area where you could expect to lose a bit of tackle until you learn the specific marks. It has thrown up some good Cod in the winter, though it is often ignored as a Cod mark in favour of Chesil Beach. Fishing with lures along the groynes may well produce Bass, Pollock, Mackerel and Garfish. 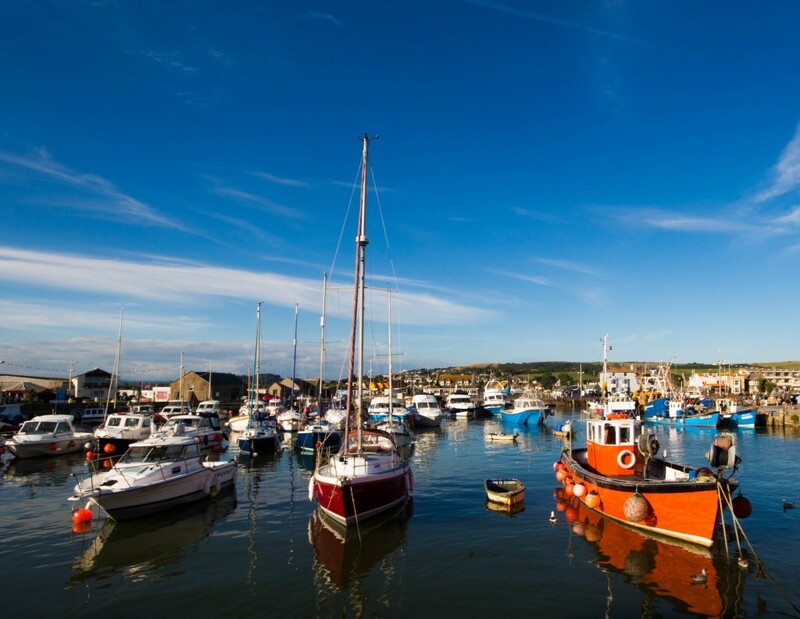 Local services & amenities: Despite being a tiny village, West Bay has two tackle shops; Potters Tackle and West Bay Water Sports. I have been assured that Potters remains open, but every time I have been to West Bay recently it has been closed. On the Other hand the much larger West Bay Water Sports is open seven days a week. They always seem to have a good selection of bait at all times of the year. It is one of the few tackle shops in the area that seems to have Blow Lug all year round. They also normally have fresh Peeler Crab and live Hermit. As with any tackle shop it is a good idea to book your bait in advance. There are numerous B&B’s, Caravan parks and hotels in the area and in the village. It is one of the few marks in the area where you are within yards of the fishing from your accommodation. Bait and techniques: As the ground is clean you can fish light. There is no need for long casts. A short lob with a 2 hook flapper rig, baited with Rag or Lug worm on size 1 hooks, will do for most of the species. Peeler Crab is good in April and May, but after that worm baits are just as effective. 9 Responses to "Dorset fishing marks: West Bay"
Good review Sean — haven’t been to West Bay in years. I guess you need a drop net for the harbour? Are there many places you can get down to near the water — thinking regarding lure fishing and landing fish. Hi Sean, we enjoyed the review and often fish the harbour at West Bay. We have caught pollack, mackerel,scad, whiting and pouting. We have seen caught by others, mullet, gurnard a small ray and silver eels. We just drop a line down the side wall baited with prawns or small bits of worm or mackerel. LRF type fishing works well but the fish tend to be generally small. There are no casting signs up all along the piers, although people still do, and signs saying not to climb on the rocks alongside the right hand pier. We have not tried fishing the beaches yet but a young lad we know has caught bass from the beach on feathers. I fished here in August last year and had a silver eel from the shingle stretch to the east of the harbour. We also went out on the Ruby J booked through West Bay Charters in the tackle shop and had a fantastic mixed bag on the reef including pout, wrasse, pollack and bream. Apologies. The post above should have been in the Portland Harbour thread in response to the comments about commercial netting of bass – possibly in nursery areas. 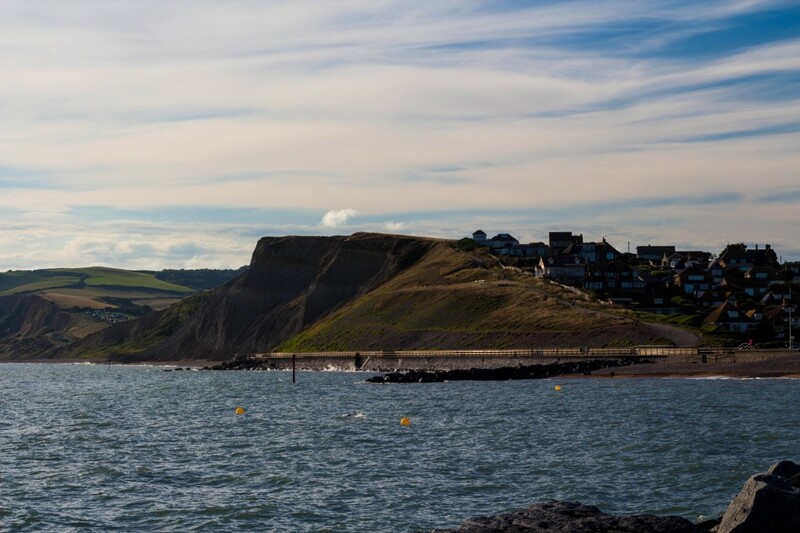 Just bought a place outside West Bay so really looking forward to some fishing time…..would anyone care to suggest a good spot for lugworm digging? There are no good spots in this area to dig lugworm. The few places you can find them have been hit so hard, that all that is left is immature worms.